Postpartum bodies are something of a secret, previously kept hidden under layers of comfortable clothes. It wasn’t an issue that achieved much airtime, and certainly wasn’t something that most people were interested in. In fact, the only media representations of postpartum bodies were the awe-inspiring magazine articles about celebrity mamas showing off their perfectly toned abs mere weeks after having babies. She’s lost the baby weight, doesn’t she look great! Well, yes, she does, but not many people look like that so soon after having a baby. Realistic representations of postpartum bodies just didn’t exist in the media. When the only example of postpartum bodies were flawless celebrity images in glossy magazines, it’s no wonder women ended up feeling pretty crappy about how they looked. With a newborn baby at home, you’re likely to have a saggy tummy, a stretched out belly button and an impressive array of stretch marks snaking across your skin. And while that’s normal, not many women are aware of that. Thankfully, due to the rise of blogs and social media, this is now changing. Women are opening up and sharing the truth about their postpartum bodies. The internet is being flooded with beautiful and inspiring images of new mamas rocking their postpartum bodies. There have been a number of photography projects highlighting the beauty of postpartum bodies, and now this issue has gone viral. 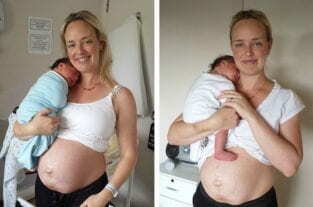 Julie Bhosale, a blogger from New Zealand, shared some photographs of her postpartum body on her blog and the post went viral. As a nutritionalist, Julie is only too aware of how many people are more concerned with how they look than how they feel. She wanted to show people what a postpartum body really looks like. She shared photographs of her tummy after the birth of her second son. The photographs were taken 24 hours, two days, one week, two weeks, 10 weeks and 14 weeks after the birth. The resulting blog post captures the transformation of her body in the weeks after the birth. 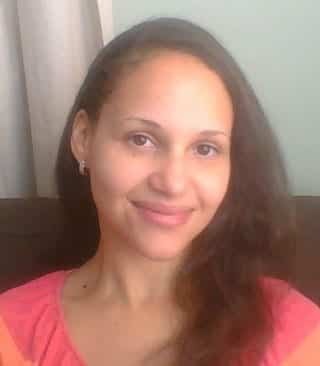 The words ‘you are beautiful, you are amazing, you are a mother’’ are repeated throughout the post. That’s a great mantra for any new mama who is struggling to love her postpartum body. Your body may be different now, it may not look exactly like it did before, but it is still beautiful. Julie asks her readers to focus on how they feel rather than how they look, an important message for new mamas who maybe need a little TLC. The post quickly went viral, accumulating over 75,000 likes on Facebook. The post was even shared by Ashton Kutcher who said it was time to celebrate reality. It’s not hard to see why. Finally, someone was talking openly about postpartum bodies and what to expect. Mothers across the world commented with messages of love and support. Some even started joining in with the campaign. A quick search on Instagram will reveal thousands of images of proud women showing off their postpartum bodies under the hashtag #takebackpostpartum. There are plenty of reasons to celebrate your body now that you’re a mother. Here are just five of them. That’s not a nice thing to say, a huge percentage of the women folk don’t have a runway physique, and that doesn’t make them mediocre. So be nice. Ross? So you’re a guy who’s commenting on women issues? How would you feel if I commented on your penile dysfunction? Hate to bust your balls Ross but I was a fit 55kg pre pregnancy had a very healthy pregnancy gained 20kgs had a 10 pound 7 oz baby and guess what? I didnt bounce back.. im at 57kgs and in fact my stomach still is a little flabby, which I’m in progress of toning 8 months pp so sometimes its just not as simple as having run way physique that will enable you to snap back post baby! Oh really? Nutrition influences your body? And genetics? And age? Crap! The didn’t tell us that in school… Thanks for that dude. Hey man, did you know that one of the last things on most new mum’s minds is how they would look on a runway? -This article was not saying that being a model is bad, or having good genes is bad, it is just saying that it is also okay to have a different shaped body too. Different genes. Maybe a higher age. Have had a pregnancy that was not controlled by a personal trainer, or just didn’t stay skinny as it wasn’t important to them at the time. Women get so worried about their bodies; so reassuring women that their body’s are fine (like the blogger above’s body really looks healthy and fine) and that not every one looks the same is actually good, and could positively impact on outcomes for their children, as their mums are not obsession about their bodies and diets and who is fatter than them. you probably already had an out of shape body, a pregnancy is a great excuse to stay that way. Do you gain something by leaving a negative comment? Do you lose something by not? Pretty sure with some self control, people do not really HAVE to be assholes. Just seeing the comments completely ruined this entire post. I was in great shape after having three kids but the stretch marks are always there and the skin will never go back to normal no matter how healthy i ate, if i weight trained, ran, biked, hiit, etc. It will never go away and now I have another baby and once again i have a ton of weight I couldn’t avoid gaining. After seeing this I just want to give up. I’ll never get my body back no matter how fit i get and here we see people being horrible and they wonder why moms go off the deep end and kill themselves after a baby. Bravo idiots. Guys need to understand that the females may love there original bodies but they love there partner or huby more so they chose to make a baby and the males need to shut up if there not happy with how a women looks after having a baby! My partner and i have 4 kids and yeah her body has changed but i couldnt be happier. My beautiful ‘runway’ style mega fit size 6-8 trim toned and terrific 32 year old body is changing. I am now a healthy size 12 thank you very much. With very large breasts. And bottom. And belly. Exercise made me feel sick being pregnant this time. Rather than being an itsy bitsy barbie, I have become cloud like and graceful. I love my swollen body. I’m my baby’s mum! No matter how I shape-change I will always be my baby’s mum. I have a fabulous four year old who can testify to that, and is actually glad I have gotten bigger to be able to look after our baby growing in me. My fiance thinks my body is great fun! I have some serious bounce! Anyway… A friend described his body to me as his ‘meat puppet’ once; just a thing that you can do with what you like. So I am! I am looking after my little baby with it! …at the end of the day, when your little one looks you in the eyes and smiles at you or gives you a hug, body shape does not matter. My body has not changed much after pregnancy but there are some “reminders” left, which nicely remind me how lucky I am to have experienced pregnancy and have an amazing child. To the people, who leave nasty and not so nice comments to mothers, (who are probably single or soon to be single with an attitude like that, possibly even angry at their partners for leaving them ” not knowing why”-here is a clue), whatever opinion you have, keep it to yourself if you can not say something supportive in such a important and crucial time, do not comment. The world is sick and tired of entitled people with debilitating self-esteemes, who need their egos stroked and have a constant need to be “right”…. take a deep look in the mirror…. what do you see underneath your skin? So sad….